GLENDALE, Ariz. -- The first words Bill Clinton spoke as president, as he opened his first inaugural address in 1993, could stand as the official motto of spring training: “Today we celebrate the mystery of American renewal.” Every camp every year is the birthplace of another chance, not just for each team, but also for the many desperate souls who show up without a guaranteed contract. Among the non-roster players invited to camps this year are Baltimore pitcher Mark Hendrickson, a 40-year-old grandfather; Kansas City catcher J.C. Boscan, 35, who across 18 pro seasons has come to the plate 5,043 times (all but 30 of them in the minors) and never hit a triple; Washington second baseman Dan Uggla, the home run leader among active players at his position; and Kansas City pitcher Ryan Madson, a survivor of two Tommy John surgeries who earned $9.25 million over the past three years whole throwing exactly one inning – in A ball. To find the craziest renewal story of all, however, you must dig even deeper – all the way to a back field at the Chicago White Sox minor league camp. Here, not even invited to major league camp, you will find Brian Anderson, a former first-round pick who turns 33 next month, who hasn’t played baseball since 2012, who hasn’t had a hit on any level of professional baseball in six years, and who last year was working for a genetic testing company in Arizona. Anderson, once a gifted five-tool centerfielder the White Sox counted on to be a star, abruptly quit playing centerfield in 2010 to reinvent himself as a pitcher, only to be out of baseball after three seasons with four organizations and an arm that continually throbbed with pain. Now he is back as an outfielder again – looking for his first hit since Oct. 3, 2009. The story of Brian Anderson isn’t just about renewal, and the lengths to which grown men will continue to search for it from the same game they learned as children. It’s also about caution. It’s about the caution all us should remember this time of year when teams and reporters, as if light-headed from the sweet smells of freshly cut grass and suntan lotion after the dark chill of winter, talk about prospects as if it’s 1848 at Sutter’s Mill in California. And it’s about the caution of what the measurables in a scouting report can’t tell us about prospects. Anderson was good at baseball. He just wasn’t very good at being a professional baseball player. Anderson was the Arizona state high school player of the year who played on the same Tucson high school team with three other future big leaguers, Ian Kinsler, Scott Hairston and Chris Duncan. (Somehow they lost in the state quarterfinals.) He stayed home to attend the University of Arizona, where he played outfield and pitched, though his time on the mound was brief. He posted a 5.40 ERA in 21 2/3 innings in 2003. That June, the White Sox selected Anderson as an outfielder with the 15th overall pick in the country and signed him to a $1.6 million bonus. Within two years, Baseball America rated him as the 37th-best prospect in baseball. That same year, 2005, Anderson made his major league debut, on Aug. 16. Ten days later, he smashed two home runs in the same game off Mariners righthander Felix Hernandez. Anderson was not on the playoff roster when the White Sox won the World Series that year, but he did receive a world championship ring – “My mom keeps it,” he said. “It’s safer in her hands than mine” – and Chicago thought so much of him that one month after the series it traded centerfielder and fan favorite Aaron Rowand to Philadelphia to get DH Jim Thome and to open a spot for Anderson to play every day. “He will carry this team [in the future],” manager Ozzie Guillen said the next spring training. On a cold, wet Opening Night in 2006, just after the White Sox raised a championship banner for the first time in 88 years, Anderson slashed two hits and drove in two runs in a victory over Cleveland and CC Sabathia. The next game, two days later, with righthander Jake Westbrook pitching for Cleveland, Guillen benched Anderson. Anderson went 17-for-122 (.139) over the next two months. He finished the year at .225, getting 405 plate appearances. He would never see that much playing time again. 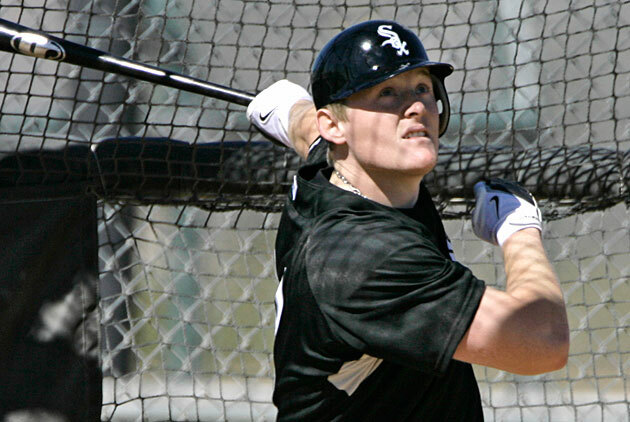 Brian Anderson, shown in 2007, never became the star he was expected to be, but he's back in White Sox camp this spring. Anderson did play superlative defense. With a diving catch, for instance, he secured the final out of the victory that clinched the 2008 division title for the White Sox. But he never hit consistently. Chicago traded him in July of 2009 to Boston. That winter, Anderson, a career .227 hitter, signed for $700,000 with Kansas City. He went to camp with an opportunity to make the club as a reserve outfielder. Why didn’t Anderson hit? First you have to understand how difficult baseball is even for those identified as the very best high school and college players. Among the top 30 picks in the 2003 draft, Anderson is one of 15 players never to reach even a modest career WAR of 2.0, including eight players who never spent a day in the big leagues. In other words, you could flip a coin and your odds of hitting it on one of the top 30 players in the country would be just the same as if you invested hours upon hours of manpower in scouting and development. Just ask the White Sox how difficult it is to draft a sure thing. The last time the Sox drafted a position player who became an All-Star for them was third baseman Joe Crede, way back in 1996. From 1997-2011 the White Sox drafted 369 position players and none of them became an All-Star for Chicago. Only five of them have managed a career WAR of even 6.0, including time spent with other clubs. Rowand (20.8) is the best position player they have drafted in the past 18 years, followed by Chris Young (15.3), Hairston (6.6), Ryan Sweeney (6.6) and Gordon Beckham (6.2). The White Sox did their homework on Anderson. Indeed, they tracked down the host family where Anderson stayed while playing in the Cape Cod League, a top summer collegiate league. The homeowners raved about how nice Anderson was to their special-needs child. Also buried in Trillo’s kind words then, however, was a clue. He mentioned that Anderson had some trouble hitting the curveball in the minors. Still, Anderson -- with his speed, power, arm and size (6'2", 215 pounds) -- looked like a future star. Teammates enjoyed being around him and his sunny outlook. He once was described as a surfer dude from the desert. In spring training one year in Tucson, when veterans thought they were needling him by telling the rookie he would have to host a team party, Anderson responded enthusiastically with a well-planned event that was a hit. And here is what the scouts could not have measured: given a $1.6 million bonus, a big-league job in Chicago two years out of the draft and an eager-to-please personality, Anderson grew easily distracted. “It was never drugs or anything like that,” Anderson said. “It was a lack of focus. I just got caught up with people who wanted to have fun and have a good time. I was young and didn’t know enough to say no and stay focused on being a ballplayer. I didn’t say no because I thought I’d really be missing out on something. I thought if I said no these opportunities with these people wouldn’t be there when I was done playing, and I had it exactly backward. It turns out those things are always there but baseball isn’t. I asked Anderson, knowing how difficult baseball became for him, if he ever tried performance-enhancing drugs. He laughed. Kansas City sent him to extended spring training for two months, then moved him to Rookie League ball, and then to Class A, and then to Triple A. He pitched well but not often: a total of just 17 1/3 innings in which he struck out 17 batters, posted a 2.08 ERA and threw 95 mph. The Royals cut him after the season. Anderson, after being cut by Kansas City, received a second chance on the mound from the Yankees. They brought him to spring training in 2011, then assigned him to Double A. Anderson allowed one earned run in 7 1/3 innings before New York cut him in May with a sore arm. A month later he underwent surgery to address thoracic outlet syndrome. Doctors removed a rib from underneath his collarbone. The next year the Dodgers gave him a third chance. They cut him at the end of spring training. A week later the Rockies picked him up for a fourth chance – and cut him a week later. Anderson pitched briefly that summer for the independent Somerset Patriots and then in the Puerto Rico Winter League. Nobody else called. His career looked over. Anderson continued to work out and occasionally took batting practice. Sometimes he stopped by the University of Arizona. One day last year, while leaning on a batting cage, he was chatting with coach Andy Lopez and Shelley Duncan, a friend and Chris’ older brother. They could tell Anderson was restless, that he wasn’t happy with how his career ended. They knew he had been an outfielder at heart, and having abandoned it was like walking out of a movie or putting down a book before reading the last chapter. Realistically, Anderson has almost no chance of making the White Sox club – not from the back fields of the minor league camp. And the chances aren’t much better that they will assign a 33-year-old outfielder to take away at-bats from prospects in Triple A. His best hope is that a scout from another club sees enough left in the player Anderson never was, and that he can help somebody as an extra outfielder who can still run down flyballs and solve the riddle of hitting better than he did when he was 23. The movie doesn’t need a Hollywood ending. The book doesn’t need a dramatic final chapter. His story, left unresolved in his heart five years ago, just needs any old ending, so that the next time Brian Anderson is leaning on a batting cage and talking about his career in the past tense, he and his friends will know he gave it his best shot. And when he does, he will have found renewal.